The Savio Varsity boys basketball team returned from the Fredericksburg Varsity tournament UNDEFEATED, winning 4 games vs. Canyon Lake (57-40), Burnet (48-41), Llano (53-27) and Lytle (80-58), to run their record to 11-8 on the year. Senior Kevin Owens and Junior Logan Blow were named to the All-Tournament team. A great effort by the Eagles to close out the year! The Eagles hit the road again on Jan 3 to play Lampasas beginning with Freshman and JV at 10:30am then Varsity at 12:00pm. 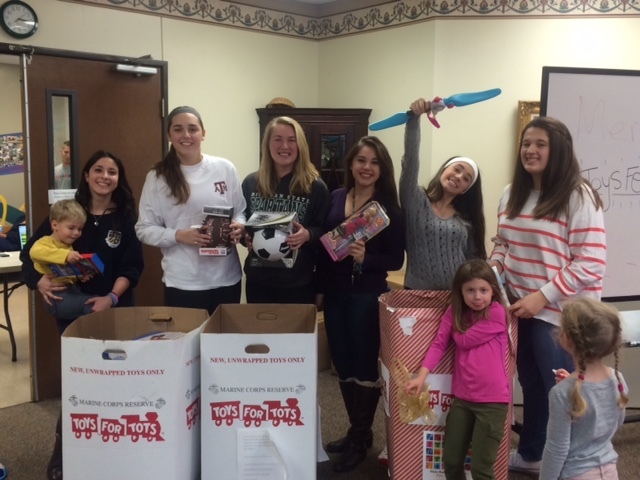 Savio volleyball players volunteered at Toys for Tots serving Williamson County Families on Saturday. The U.S. Marine Corps Reserve Toys for Tots program is a charitable organization that collects and distributes toys to needy families at Christmas. While Marines run the program, they depend upon generous donation and volunteers to help. Our girls helped to deliver gift bags of toys for local families. 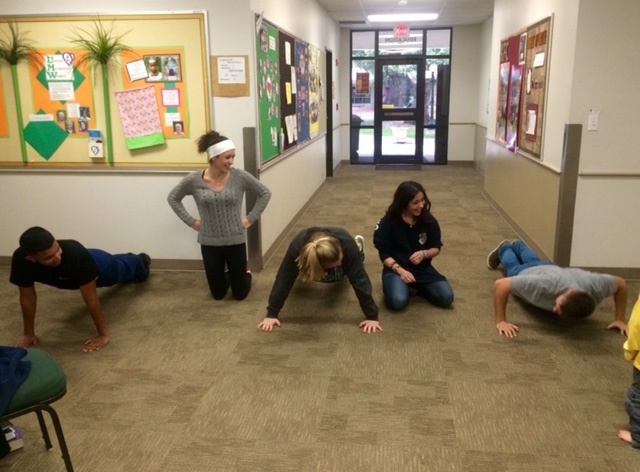 During a slow period, they challenged a couple Marines to a push up contest. The Marines won, but Sarah Grenier provided a good competition. 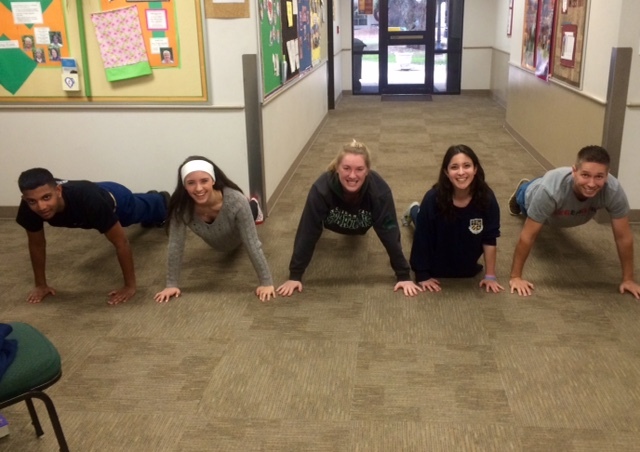 Sierra offered a squat contest, and the Marines declined! The USMC toys for tots head, Chief Davidson, was impressed with our Savio leaders, and asked us to come back next year! On December 18th members of our Savio music program went Christmas Caroling at Gracey Woods Nursing Home. The senior citizens really enjoyed the music and the youthful energy of our Savio students. Merry Christmas and Happy New Year from the Savio Music Program! The Savio Cheerleaders are #5 in the Nation! They have been awarded 5th place in UCA's American School Spirit Award. 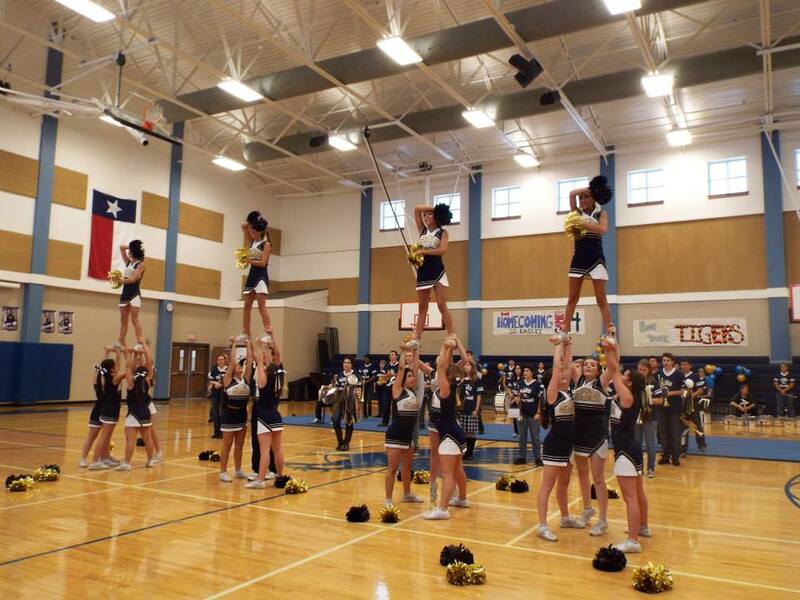 "The American School Spirit Award recognizes the top All-Around programs in the country. UCA looks for teams that exemplify community service, outstanding athletic support, spirit raising activities, and high academic standards." Congrats to all the Cheerleaders and Coach Michelle Clay on winning such an honorable Award! St. Dominic Savio Sophomore Sean Grieshop has returned from the United States National Juniors meet a champion, shattering two national records. Grieshop won the meet's high point award, signifying that he was the overall best swimmer at the meet. There were more than 1200 of the country's fastest junior (18 & under) swimmers at the competition, most between the ages of 15-18. Grieshop won the 500 freestyle and broke a national record with a time of 4.16.59. He won the 400 IM race the following day and just one day later put the hammer down on the national record in the 1650 (mile) swim with a time of 14.45. Sean also picked up 2nd in the Nitro team 800 free relay, 5th in another relay, 8th place in the 200 breast and 8th place in the 200 free. He swims locally for Nitro Swimming. On Saturday December 13th the Savio Quiz Bowlers played their first tournament since September 20th. The HoHoHo (Houston Holiday Hoedown) is always one of the biggest tournaments of the year, and that trend held true this year as well. A total of 24 teams competed in Division I including the Savio "A" squad of Eleazar Camez, Grace Isakson, and Patrick Lahey. The Savio "B" squad of Jack Frey, Nicholas Isakson and Andrea Poblete competed in Division II, along with 19 other teams. The A team struggled in their first two matches against teams from St. Thomas Catholic High School and LASA. They tasted success early in the match against Kealing and led 160-80 at the half. But Kealing caught fire in the second hald and claimed the match by a score of 290-175. The Eagles gained some confidence and got a little momentum going as they defeated Awty Euler 280-195 in their fourth match. But they were rattled by a convincing loss against another squad from LASA in their 5th match of the prelims. The A squad's final prelim match was against a high caliber team from Bellaire. The Eagles were in the groove and held a 255-235 lead going into toss-up number 19. But Savio negged on an awkwardly-worded economics question, answering "wealth" where the expected answer was "status". Bellaire grabbed this tossup and 20 of 30 bonus points to take the lead at 265-250. Bellaire then held onto victory by getting the final toss-up, winning by a final score of 300-250. The Bellaire team's only loss of the prelims was against a strong LASA team, and Bellaire entered the playoffs as the #5 seed. The Eagle A squad's 1-5 prelim record put them into a tough spot as the #20 seed for the playoffs. They met the #11 seed from Village High School in Houston, another team playing with just three players. The Eagles held a lead at 85-70 at halftime, and jumped on the first two toss-ups of the second half to take a 145-70 lead. But Village owned the rest of the match, pulling away to win by a score of 230-185, ending the day for the Eagle A squad. But the Village team's tournament did not last much longer as they lost their next match to a LASA team 330-295. Leading scorer for the Eagle A squad was Eleazar Camez with 30.71 points per game (5 powers and 2 NEG5's). The B team also struggled in their first match, being a bit slow on their buzzers. They dropped their first match against iSchool "A", but stormed back with a 155-95 victory against Cinco Ranch "D" in their second match. In the third match the Eagle B squad held a late 110-100 lead against Katy Taylor "B". But the Eagles could not buy a point on any of the final five toss-ups and fell by a score of 130-110. The St. Thomas Catholic "B" team, who went undefeated in the prelims, handed the Eagle B squad their most lopsided loss of the day, 240-110. But Savio B ended the prelims with convincing victories over Harmony Beaumont (225-60) and Cinco Ranch "C" (190-40). The 3-3 record gave the Eagle "B" squad the #10 seed in the Division II playoff bracket. They faced #7 seed Parish Episcopal from Dallas. It was a very even match and once again the Eagles had a late lead at 130-85. But the Eagles negged on toss-up number 17 and were shut out for the rest of the match. With the score tied at 125-125 after #19, neither team could correctly answer tossup #20. So the match continued with a 21st toss-up as a tie-breaker. Unfortunately the Parish team beat the Eagles to the buzzer and took the match 135-125. Nicholas Isakson was leading scorer for Savio "B" with 52.86 points per game (4 powers and 2 NEG5's) and was the #3 individual scorer in Division II. Next up for the Quiz Bowlers will be a regional qualifier for the National Science Bowl in College Station on February 7th. On that same day the Eagles will also compete in a regional qualifier for the Academic World Quest at a site to be determined in Austin. Our Eagle boys programs had a fantastic weekend of performances as they continue to move towards district play. The Savio varsity finished 2nd place to visiting Arlington Grace Prep but won games against Marion 50-40 and Burnet 68-40 to capture the runner up plaque. Kevin Owens and Logan Blow were named all-tournament. The Eagle freshmen team continued to steam-roll thru the competition as they won 4 games in Liberty Hill, winning the Panther tournament in a runaway. The Eagles "fish" now stand 9-1 and continue to improve each week. All three teams will be at home this Friday, Dec. 19 beginning at 3pm vs Wimberley. Come out and cheer us on! St. Dominic Savio was asked to gather 100 fleece blankets for needy children in Mexico. All the families competed to see who could donate the most; the winning family would get the Eagle. We actually collected 311 blankets! Thank you to all the students and parents who donated! Your generosity is very much appreciated. Congratulations to our Boys Soccer team for taking Second Place at the St. Mary's Hall Tournament this past weekend! Defeating St. Anthony Catholic School from San Antonio 8-2 on Friday, propelled them into the Championship Bracket for Saturday. In the finals they played St. Pius out of Houston and at the end of regulation the score was tied 0-0. At the end of the overtime period the score remained 0-0, which then moved the game into Penalty Kicks. The game came down to two rounds of Sudden Death Kicks in which St. Pius prevailed with a 6-7 win. Great showing for our boys and Coach Lee Stooksberry. 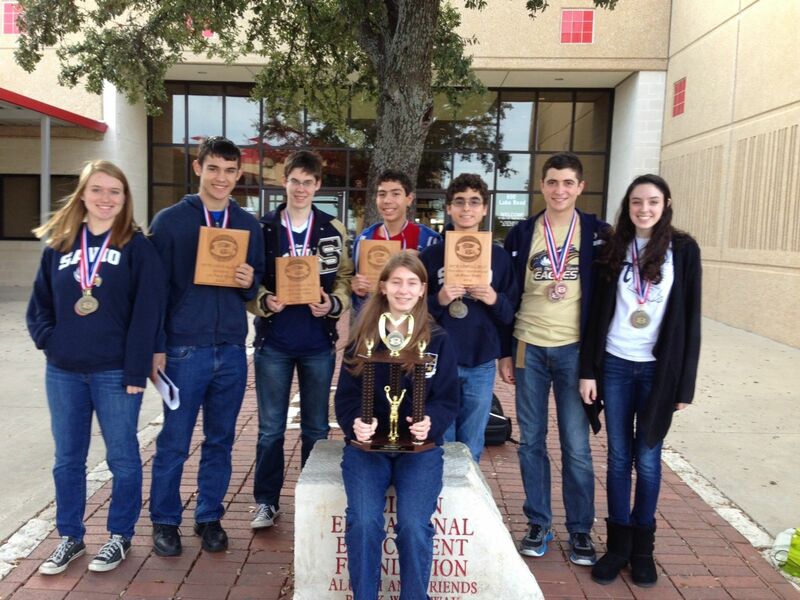 On Saturday, December 6th the Savio academic team successfully defended their title at the Belton High School Invitational tournament. The Eagles finished in first place overall against a field of 20 schools. The field included four teams from 6A public schools. In addition to winning first place overall, Savio was also the first place team in the following events: Number Sense, Calculator, Science and Math. Savio's JV and freshmen, playing in the strong Burnet sub-varsity tournament, surprised the field by rolling into the finals of the tournament with impressive victories on Thursday. On Saturday, the Eagles lost in close games to finish the event as runners-up, a very impressive performance against some top central Texas teams. Hats off to our Eagles and their stellar performance! The Savio Eagles ran their season mark to 6-6 last night with a strong 70-43 victory over Georgetown Gateway Prep. The JV stayed undefeated by pounding Gateway's JV as well. After their 6th victory vs the Dripping Springs Saints on Tuesday evening, the Savio freshmen, along with our JV, are traveling to Burnet to play in the finals of the Burnet tournament. Both Eagle teams remain undefeated at the time of this writing, having beaten both powerful Liberty Hill and Fredericksburg to move into the finals. Monday, there will be a final recap of their performance. Congratulations to both teams for this great showing! Congratulations to the Eagle Swim Team who collectively posted fast enough times to win the TSD Meet. They competed against 5 other teams including a couple from our district. Their combined efforts resulted in the FIRST multi-team meet win in Savio history!!! "It is not always about getting a best time individually but also about swimming with and for your school and team mates." - Coach Chris. The Savio cheerleaders will be hosting the 2nd Annual Savio Cuts for Cancer Day on Friday, February 13th, 2015 after school in the gym. We would like to extend an invitation to all who would like to donate a minimum of 8 inches of hair to the Pantene Beautiful Lengths program. Ponytail donations are collected to make real hair wigs for those who have lost their hair while battling cancer. Last year, the Savio Community donated 63 ponytails! It is our hope to beat that this year, so please feel free to share this opportunity with your friends, family, co-workers, etc. More information will be released as we get closer to the event, but we wanted to let you know now, so you aren't tempted to cut it off for the new year.